Here’s a timely reminder for all salespeople and coaches from a real life fossil hunter. The idea of hunting for fossils fascinated me and my three children whilst on holiday in Dorset’s Jurassic Coast last month. I mean the chance of uncovering a dinosaur or two was just too much for us all and it was this that drove us to the famous fossil shop at Charmouth. 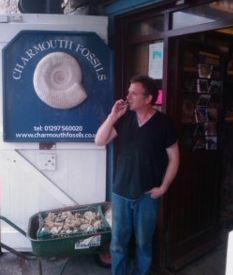 Owned and run by a real life professional fossil hunter, the shop was a paradise of fossils of all shapes and sizes. And the chap that ran the place was a marvel to behold. What he didn’t know about fossil hunting wasn’t worth knowing about. And most of us in the shop knew very little about fossil hunting. He was very gracious to let everyone have his expertise and wisdom to help them with their own fossil hunting activities. He was showing photos, explaining the best places to go, re-counting stories, giving tips and experience readily. And the funny thing was – that he was selling bucket loads of fossils and fossil hunting paraphernalia whilst dishing out his expertise. As salespeople or sales coaches how much expertise do you have in your area? And how much of this knowledge and expertise are you willing to give to customers when they need it? To help them solve their problems and meet their challenges. It’s your expertise, experience and wisdom that can help your customers to solve their problems. And the funny thing is – your customers will buy your products or services. So take a lesson from my real life fossil hunter. Know your industry back to front, become an expert in all problems and challenges facing your customers, and freely give this understanding to help your customers solve their problems. And you’ll be rewarded with sales along the way. Next week we’re off camping again, this time in South Devon…roll on the sunshine.